Based in Buncombe County, John P. Wood is a Certified Public Accountant dedicated to providing accurate and precise tax preparation, payroll processing, and comprehensive account/bookkeeping services. Our firm is designed to offer the same attention to detail to all clients, no matter if it’s an individual, business, or not-for-profit organization. 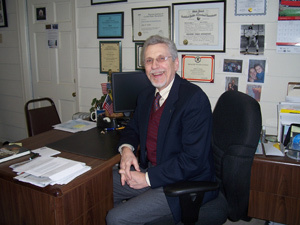 With nearly 40 years of experience in the industry, John P. Wood, has been in business in Asheville since 1991. We are dedicated to treating every client with integrity and respect. Understanding the different services needed for small businesses and not-for-profit organizations, our firm has catered and perfected our services to best meet our clients’ needs. While our firm’s typical clients are small business owners needing various levels of expertise in accounting and tax issues, as well as individual tax filing clients. We are equipped and experienced in preparing returns for sole proprietors, partnerships, Sub Chapter S and C corporations. There is value to be understood in working with the same accounting firm year after year. The majority of our clients come to us from larger CPA firms. Each year they find themselves telling their story over and over again to a new person. It is our goal to make sure that doesn’t happen to our clients. We strive to provide personal and interactive service to each of our clients. John is a Certified Public Accountant and is a member of the North Carolina Association of Certified Public Accountants.